Leg length discrepancy is an orthopaedic problem that usually appears in childhood, in which one’s two legs are of unequal lengths. Often abbreviated as ‘LLD,’ leg length discrepancy may be caused by or associated with a number of other orthopaedic or medical conditions, but is generally treated in a similar fashion, regardless of cause and depending on severity. Leg length discrepancy is sometimes divided up into ‘true LLD’ and ‘functional LLD.’ Functional LLD occurs when the legs are actually equal in length, but some other condition, such as pelvic obliquity (a tilt in the position of the pelvis), creates the appearance of legs of different lengths. True LLD will be the focus of this website and its causes are more fully described in the below section (?What causes leg length discrepancy?’). As patients develop LLD, they will naturally and even unknowingly attempt to compensate for the difference between their two legs by either bending the longer leg excessively or standing on the toes of the short leg. When walking, they are forced to step down on one side and thrust upwards on the other side, which leads to a gait pattern with an abnormal up and down motion. For many patients, especially adolescents, the appearance of their gait may be more personally troublesome than any symptoms that arise or any true functional deficiency. Over time, standing on one’s toes can create a contracture at the ankle, in which the calf muscle becomes abnormally contracted, a condition that can help an LLD patient with walking, but may later require surgical repair. If substantial enough, LLD left untreated can contribute to other serious orthopaedic problems, such as degenerative arthritis, scoliosis, or lower back pain. However, with proper treatment, children with leg length discrepancy generally do quite well, without lingering functional or cosmetic deficiencies. The majority of people in the world actually have some degree of leg length discrepancy, up to 2cm. One study found that only around 1/4 of people have legs of equal lengths. LLD of greater than 2cm is relatively rare, however, and the greater the discrepancy, the greater the chances of having a clinical problem down the road. A limp generally begins when LLD exceeds 2cm and becomes extremely noticeable above 3cm. When patients with LLD develop an abnormal gait, one of the debilitating clinical features can be fatigue because of the relatively high amount of energy needed to walk in the new, inefficient way. Poliomyelitis, or polio, as it is more commonly known, used to account for around 1/3 of all cases of LLD, but due to the effectiveness of polio vaccines, it now represents a negligible cause of the condition. Functional LLD, described above, usually involves treatment focused on the hip, pelvis, and/or lower back, rather than the leg. If you have been diagnosed with functional LLD or pelvic obliquity, please ask your orthopaedic surgeon for more information about treatment of these conditions. The upper portionof the leg consists of a single bone called the femur, or thighbone. 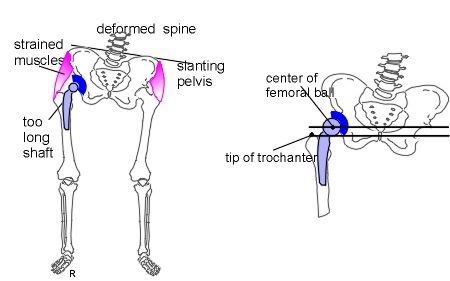 The top of the femur inserts into the pelvis to form the hip joint, which is a ball-and-socket joint. The bottom of the femur connects to the lower portion of the leg at the knee joint, which is a hinge joint. The lower leg consists of two bones, the tibia and the fibular. The tibia is the shin bone, which is the larger of the two bones and bears most of the weight placed on the lower leg, and is located to the inside of the fibular, closer to the other leg. The other leg bone is the fibular, which is a thinner bone located to the outside of the tibia and runs parallel to it. Like all long bones in the human body, the tibia does most of its growing not in the middle, but at the end of the bone during childhood, in a region known as the epiphysis . The epiphysis is responsible for the rapid production of bone and cartilage cells and the gradual lengthening of the leg. The causes of LLD may be divided into those that shorten a limb versus those that lengthen a limb, or they may be classified as affecting the length versus the rate of growth in a limb. For example, a fracture that heals poorly may shorten a leg slightly, but does not affect its growth rate. Radiation, on the other hand, can affect a leg’s long-term ability to expand, but does not acutely affect its length. Causes that shorten the leg are more common than those that lengthen it and include congenital growth deficiencies (seen in hemiatrophy and skeletal dysplasias ), infections that infiltrate the epiphysis (e.g. osteomyelitis ), tumors, fractures that occur through the growth plate or have overriding ends, Legg-Calve-Perthes disease, slipped capital femoral epiphysis (SCFE), and radiation. Lengthening can result from unique conditions, such as hemihypertrophy , in which one or more structures on one side of the body become larger than the other side, vascular malformations or tumors (such as hemangioma ), which cause blood flow on one side to exceed that of the other, Wilm’s tumor (of the kidney), septic arthritis, healed fractures, or orthopaedic surgery. Leg length discrepancy may arise from a problem in almost any portion of the femur or tibia. For example, fractures can occur at virtually all levels of the two bones. Fractures or other problems of the fibula do not lead to LLD, as long as the more central, weight-bearing tibia is unaffected. Because many cases of LLD are due to decreased rate of growth, the femoral or tibial epiphyses are commonly affected regions. Leg length discrepancy may be diagnosed during infancy or later in childhood, depending on the cause. Conditions such as hemihypertrophy or hemiatrophy are often diagnosed following standard newborn or infant examinations by a pediatrician, or anatomical asymmetries may be noticed by a child’s parents. For young children with hemihypertophy as the cause of their LLD, it is important that they receive an abdominal ultrasound of the kidneys to insure that Wilm’s tumor, which can lead to hypertrophy in the leg on the same side, is not present. In older children, LLD is frequently first suspected due to the emergence of a progressive limp, warranting a referral to a pediatric orthopaedic surgeon. The standard workup for LLD is a thorough physical examination, including a series of measurements of the different portions of the lower extremities with the child in various positions, such as sitting and standing. The orthopaedic surgeon will observe the child while walking and performing other simple movements or tasks, such as stepping onto a block. In addition, a number of x-rays of the legs will be taken, so as to make a definitive diagnosis and to assist with identification of the possible etiology (cause) of LLD. Orthopaedic surgeons will compare x-rays of the two legs to the child’s age, so as to assess his/her skeletal age and to obtain a baseline for the possibility of excessive growth rate as a cause. A growth chart, which compares leg length to skeletal age, is a simple but essential tool used over time to track the progress of the condition, both before and after treatment. Occasionally, a CT scan or MRI is required to further investigate suspected causes or to get more sophisticated radiological pictures of bone or soft tissue. The treatment of LLD depends primarily on the diagnosed cause, the age of the patient, and the severity of the discrepancy. Non-operative treatment is usually the first step in management and, in many cases, LLD is mild or is predicted to lessen in the future, based on growth rate estimates in the two legs. In such cases, no treatment may be necessary or can be delayed until a later stage of physical maturity that allows for clearer prognostic approximation. For LLD of 2cm to 2.5cm, treatment may be as simple as insertion of a heel lift or other shoe insert that evens out leg lengths, so to speak. For more severe cases, heel lifts can affect patient comfort when walking, decrease ankle stability, and greatly increase the risk of sprains. For infants with congenital shortening of the limb, a prosthetic ? often a custom-fit splint made of polypropylene ? may be successful in treating more severe LLD without surgery. In many instances, however, a surgical operation is the best treatment for LLD. Surgeries for LLD are designed to do one of three general things ? shorten the long leg, stop or slow the growth of the longer or more rapidly growing leg, or lengthen the short leg. Stopping the growth of the longer leg is the most commonly utilized of the three approaches and involves an operation known as an epiphysiodesis , in which the growth plate of either the lower femur or upper tibia is visualized in the operating room using fluoroscopy (a type of real-time radiographic imaging) and ablated , which involves drilling into the region several times, such that the tissue is no longer capable of bone growth. Because the epiphyseal growth capabilities cannot be restored following the surgery, proper timing is crucial. Usually the operation is planned for the last 2 to 3 years of growth and has excellent results, with children leaving the hospital within a few days with good mobility. However, it is only appropriate for LLD of under 5cm. Leg shortening is employed when LLD is severe and when a patient has already reached skeletal maturity. The actual surgery is called an osteotomy , which entails the removal of a small section of bone in the tibia (shinbone) and sometimes the fibula as well, resulting in the loss of around an inch in total height. Leg lengthening is a difficult third option that has traditionally had a high complication rate. Recently, results have improved somewhat with the emergence of a technique known as callotasis , in which only the outer portion of the bone (the cortex ) is cut, (i.e. a corticotomy ). This allows the bone to be more easily lengthened by an external fixation device that is attached to either side of the cut bone with pins through the skin. The ?ex-fix,’ as it is sometimes called, is gradually adjusted by an orthopaedic surgeon, and healing can occur at the same time that the leg is being distracted , or lengthened over time. Unlike epiphysiodesis, leg lengthening procedures can be performed at almost any skeletal or chronological age. For some cases of leg length discrepancy, real adjustments may be required for parents and their child with the condition. Frequent visits to the doctor or a surgical operation at a young age can represent an emotional and physical challenge for children and parents alike. However, almost all patients respond tremendously well to treatment and the condition does not present any lingering deformities. Moreover, the vast majority of children with LLD have no future restrictions on their activities and abilities following treatment, from everyday walking to demanding, competitive sports. Naturally, you may have other questions about leg length discrepancy that are not answered in the above summary. As your orthopaedic surgeons, we welcome any and all questions you may have, which we urge you to pose during your next office visit. Do call us at +65 9724 1219 if you have any queries.